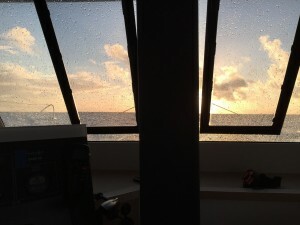 We left Fort Lauderdale early February 22, 2015. Our weather window, created between the passing of one cold front and the arrival of another, had arrived. 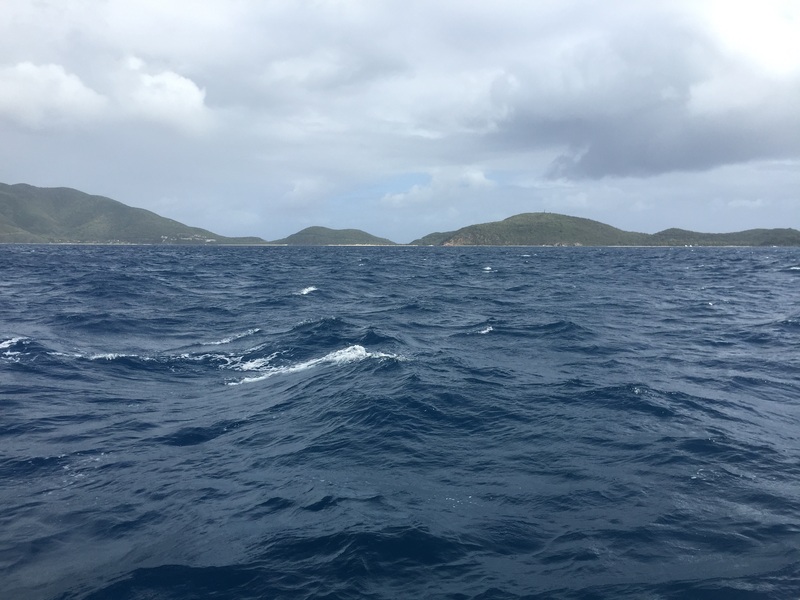 We planned to quickly head due East to avoid high winds and rough seas from the second cold front chasing us towards our destination – Tortola. 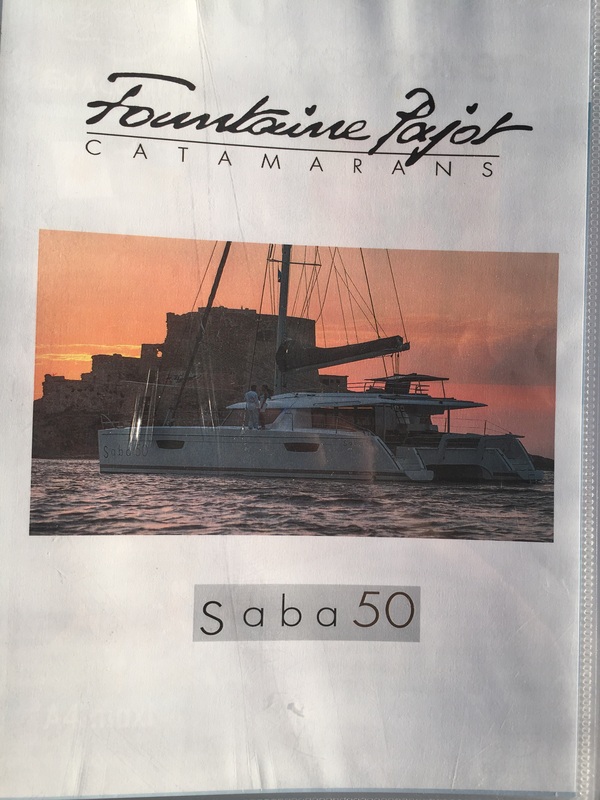 The Saba 50 is one of Fountaine Pajot’s new catamaran designs. 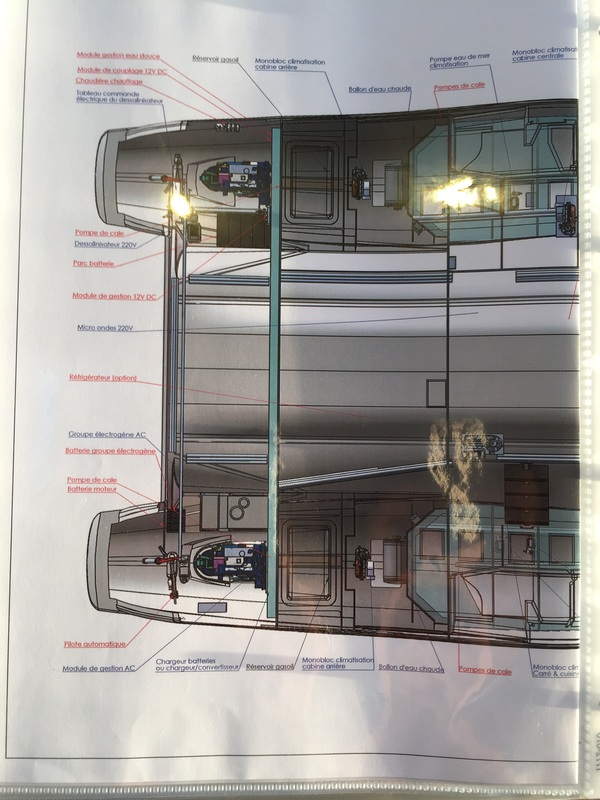 It was presented at the 2015 Miami International boat show. 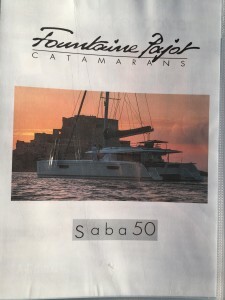 Fountaine Pajot’s YouTube video gives a good overview of the large space and comfort for this 50 foot catamaran. Leaving Fort Lauderdale we head for longitude 65. We called our course, Route 65, like the famous Route 66 that crosses the United States. The vibrating noise emanating from the stern was identified as part of the steering. The Saba 50 has a long rod which connects the port and starboard rudders. After cresting a wave the rod would vibrate as the hull pounded the ocean. We kept washing down everyday until the boat was clean. The cockpit of the Saba 50 was very comfortable; there is a large teak table to port and a small seat to starboard. I spent most of my free time in the cockpit. Later, we syphoned fuel from the auxiliary fuel drums stored in the cockpit. Captain demonstrated that the blue fuel drums could be pressurized by blowing into the drums. With enough pressure fuel would flow through a tube connecting fuel tanks and the cockpit fuel drums. Fuel was easy to transfer and none spilled, however, not all the diesel in the drums could be transferred with this method. Sleeping on the Saba 50 was tricky. Initially, I had chosen the port forward berth since it was away from the stern engine. It was quieter, but the Saba 50 is a wild beast in oncoming waves. Your organs will be jiggled until they are jelly! Captain attempted to stabilize his stomach and intestines by strapping his back brace across his abdomen! Most nights the only sleepable berths were near midships or the inside helm sofa. The rigging company had not finished their work before we left Fort Lauderdale. One of the upper battens was not connected to its car on the mast. This was very upsetting; no one bothered to tell us before we left Fort Lauderdale. The mainsail and boom are intimidating. The mainsail is huge. 900 square feet of sail area. The Saba 50 has swept back spreaders eliminating the forestay and backstay. Below is Informations voilerie. The boom is well above the ocean, maybe 20 feet, and from the helm it is another 10 feet. Staring at this great, big length of metal swinging above your head, 20 feet off the ocean, the Captain screams “Pull the luff!” as he raises the mainsail from the helm. To work on the boom and mainsail – up you go, we had to stand on top of the sundeck as the boat moved beneath us. Luckily the waves and wind were minimal. I would not want to be so high off the ocean in a storm wrestling with lines and the mainsail. Overall the rigging, mast, and boom felt well made. 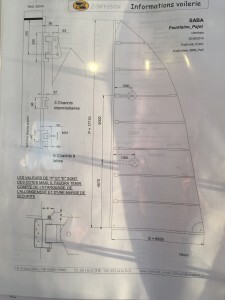 We did not use the mainsail because of the unconnected batten. I do not have much to review regarding its performance. I was at the inside helm when I took this photo. 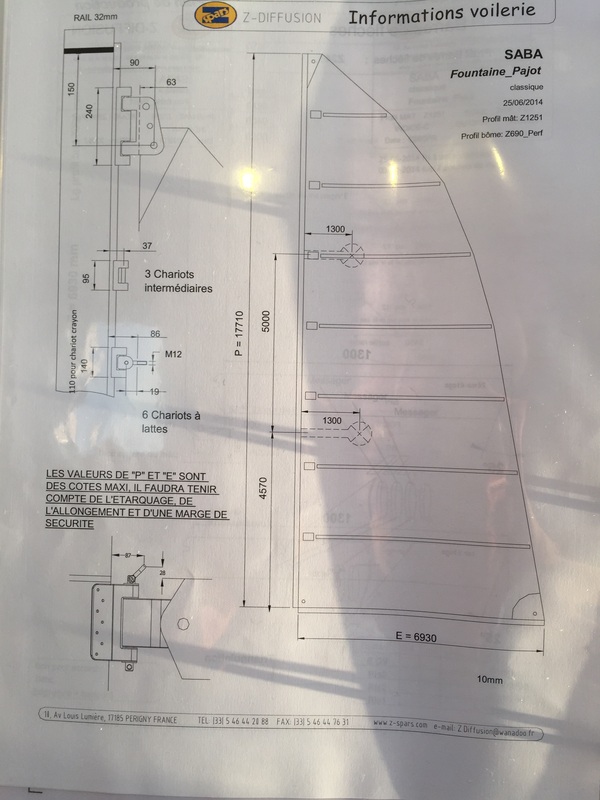 I found the position of the mast in relation to the helm protective. If you are on a early morning watch the Saba 50 provides good protection from direct sunlight. Also there are two opening windows which provide excellent ventilation. During my watch the captain and I transferred the remaining diesel from the fuel drums. This was much more difficult than the first fuel transfer. We employed a bucket and a funnel. The fuel in the drums was poured into a small bucket which was poured into a funnel connected to the fuel fill. It was disappointing to see that the Saba 50 fuel caps already began to show signs of wear. We had tightened the fuel caps with a winch handle and the hexagonal female receiver of the cap became enlarged by the winch handle. We reached longitude 65 and turned south. The wind direction was initially directly in our face but Captain had spoken with a friend by satellite phone who said the wind would become favorable. Later in the day we were able to reduce engine rpms as the wind direction was greater than 40 degrees to port. This was the minimum angle that the genoa was effective. The wind strengthened to 15 – 20 knots from the East South East and we reduced both engines to 1700 rpm. Our fuel was near 1/8 of a tank. I thought we would run out of fuel. 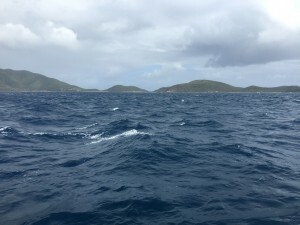 Would we have to sail into Tortola with no fuel? Early on day seven, the waves were the largest of the trip. The waves were 10-12 ft. Captain cut one engine to conserve fuel. It felt like surfing one endless wave. Land! We stopped in Spanish Town, Virgin Gorda for customs and fuel. 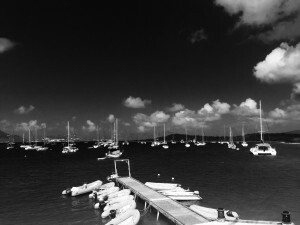 If you are traveling to BVI, Spanish Town is the least expensive customs stop.